The GrohFlex Shower Set transforms any shower into the ultimate personal spa. 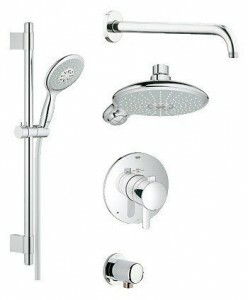 The comprehensive system comprises of both a showerhead and a hand shower from GROHE’s Power and Soul series. The former is paired with a 12-in. Rainshower shower arm, and the latter comes with a 24-in. shower bar, a soap dish and a 69-in. shower hose. Both shower fixtures feature one-click showering, which allows users to switch between four distinct spray patterns with a simple click of the button. The water temperature and volume are thermostatically controlled through a GrohFlex Cosmopolitan dual-function thermostatic valve and trim set, which incorporates a single lever handle.